In the Cabo Verde archipelago, a GEF SGP project seeks to create alternative livelihoods, reduce the pressure on the ecosystem and reactivate the first underwater trail for ecotourism. Cape Verde is an archipelago of ten islands, nine of which are inhabited, and thirteen islets located 500 kilometers west of Senegal in Africa. The country has a land area of 4,033 km2 , and a population of 545,993 inhabitants (World Bank, 2016). Salamansa is a fishing village in Cape Verde with approximately 1,170 inhabitants. It is located north of the island of São Vicente near the city of Mindelo (see figure 2) and it is a rural area where half of the population is primarily engaged in artisanal fishing for their livelihoods. The artisanal fishing community includes about 148 fishermen and 10 fish merchants, who also practice other socio-economic activities such as animal husbandry, agriculture (during the rainy season), and small scale trade. With the aim to create alternative livelihoods, reduce the pressure on the ecosystem and reactivate the first underwater trail for ecotourism, the Associação dos Pescadores de Salamansa received technical and financial support from the GEF Small Grants Programme in Cape Verde in 2010. The construction of the underwater trail in Baía das Gatas was the result of an initial partnership between Worldwide Fund for Nature (WWF) Cape Verde, WWF Germany, and the German Agency for Nature Conservation. The goal of this project demonstrate community-based ecotourism as a tool for biodiversity conservation and improvement of local livelihoods using the underwater trail as an example. To operationalize the underwater trail, the association carried out a number of key activities including the development of a marketing strategy to promote the trail, preparation of a code of conduct for its use, and selection and training of key staff to manage the trail. The second phase of the project involved the establishment of a community-based maintenance and monitoring plan for the underwater trail and an awareness raising campaign within the community about the benefits of the sustainable use of marine resources. Once everything was in place, the trail was opened to the public, excursions were promoted and organized, and the Associação dos Pescadores de Salamansa, established a fund to collect and manage trail admission fees for maintaining the trail. The project succeeded in operationalizing the underwater trail and establishing it as an eco-tourism site while also building the capacity and knowledge of the local community about ecotourism and conservation management. The code of conduct for the use of the trail and the maintenance and monitoring plan for the underwater trail were key results of the project and were instrumental in the success of the initiative and its long-term sustainability. Fifty-three local students participated in marine environmental awareness activities, including marine turtle and coral conservation and 73 members of the fishers association were involved in the implementation of the project. As a result of the capacity development component of the project, 125 community members from Salamansa benefitted from training activities, four youths undertook recycling training in partnership with local NGO Atelier Mar, 14 fishers were trained as snorkeling instructors, and support staff were trained as tour guides. Snorkeling instructors and tour guides also received training in marine environmental awareness. The management staff of the Salamansa fishermen association received administrative and financial training in partnership with the Associação of Amigos do Calhau. The project was in line with and contributed to the implementation of several national strategies and plans, including the National Action Plan for the Environment, National Biodiversity Strategy, the Bi-annual Fisheries Plan, and the Marine Turtle Action Plan. As part of the environmental awareness raising measures of the project, ten educational trail plaques were installed in the underwater trail. Each plaque served an educational purpose and was constructed with a special cement mixture, with the embedded information covered with acrylic. Despite the initial success of the project in building capacity of the community and demonstrating sustainable livelihood activities based on ecotourism, the underwater trail developed by the Associação dos Pescadores de Salamansa was eventually deactivated in 2014 due to funding issues and decreasing requests for visits. Further promotion of the site was needed to attract more tourists in order to continue the activities, while additional support was still required to overcome the market barriers. 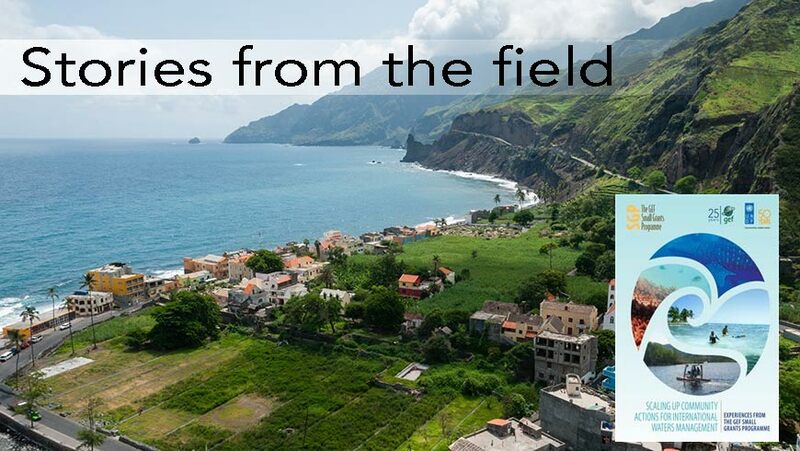 Incorporating some of the results demonstrated by the SGP funded project, a new sustainable tourism initiative was launched in the area in late 2015 with a grant of € 500,000 Euros from the European Union in Cape Verde. The project was led by a consortium of key partners including the Associação dos Amigos da Natureza, Associação dos Amigos do Calhau, the Municipality of São Vicente, and the Centro de Estudios Rurales y de Agricultura Internacional (CERAI). The project is expected to continue for three years and will support the continuation of tourism activities, including the re-activation of the underwater trail, as well as the creation of a new trail closer to the Salamansa fishermen´s village. With this enhanced support from the European Union, and continued involvement of several partners, it is hoped that the initial efforts to establish ecotourism in the area will become viable and sustainable over time.